I hope you all had a great Thanksgiving with your families and friends. Looking back on the year, I am very thankful for so many things. 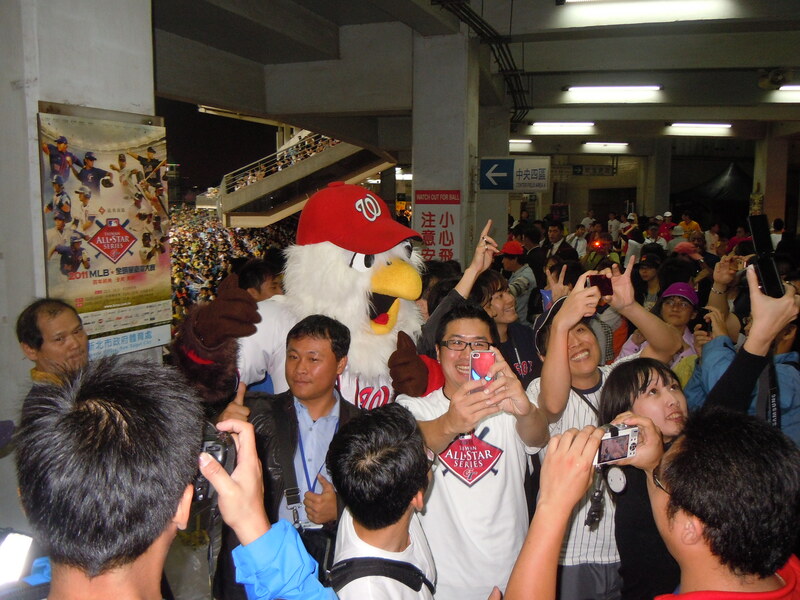 Thankful for all the Nationals fans that gave me love this past year, for the thousands of high fives and hugs I received, for the experiences I had in Taiwan and Arizona this year, and for winning the season series against the Phillies to name a few. 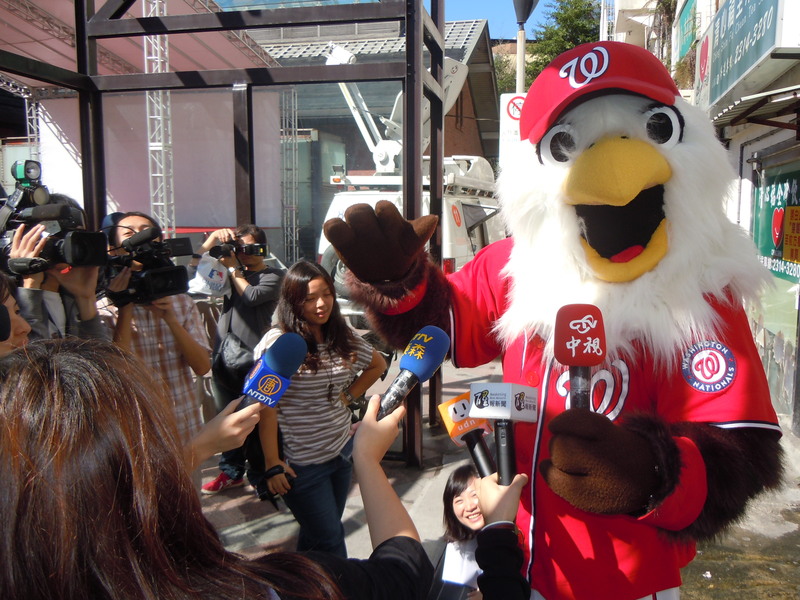 Every day I realize how lucky I am to be the mascots of the Washington Nationals, I really do! Here’s a picture of Steve Lombardozzi, Ivan Carter and I stuffing containers full of sweet potatoes to give to the less fortunate. Check it out! What are all of your favorite Thanksgiving foods? Turkey? Sweet Potatoes? Stuffing? Let me know! PS, even though Turkeys are birds, they are not eagles, making them perfectly fine to gobble up. Today is the last day here in Taiwan. Immediately after our 2:00pm game against the Chinese Taipei team in which Wang will be pitching, we head to the airport to begin our journey home. My time on the road was an amazing experience. The best part was getting to know the people in Taiwan, the culture, our players, and the overall passion for baseball here in this country. I’m very thankful to have been able to experience what I did this week. Here’s one last picture of the front of the sports section of yesterday’s Taipei Times. 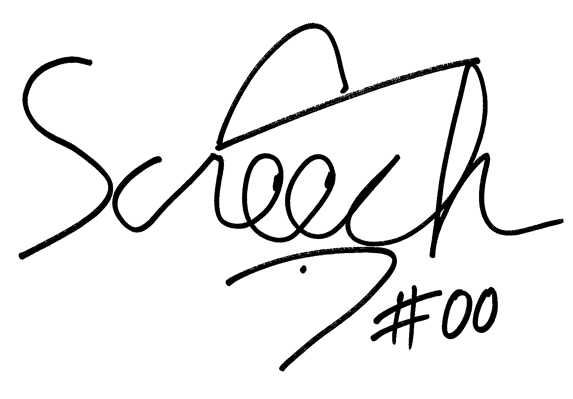 Thanks again to everyone who has followed along on this blog. Can’t wait to see everyone back home in DC! 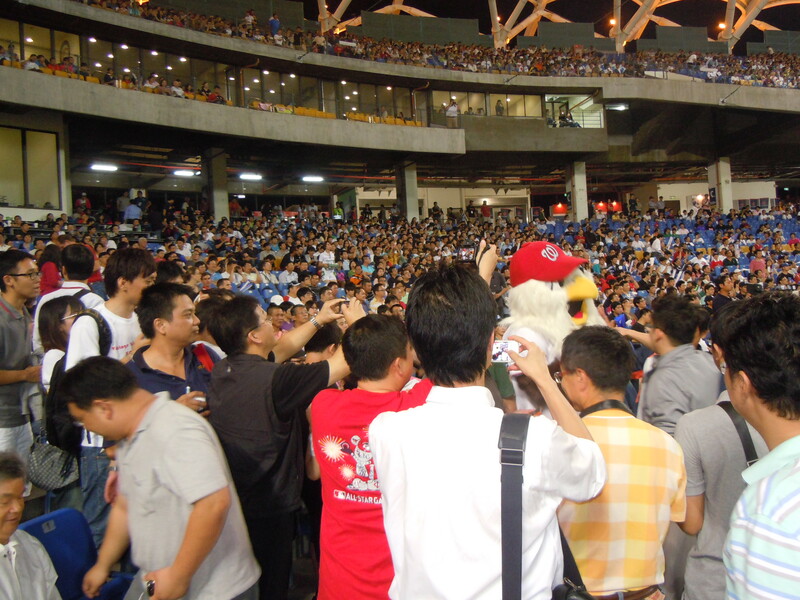 Last night’s game was at Intercontinental Stadium in Taichung, Taiwan. Once again there was a full crowd. The fans here react to every pitch and every swing as if it was game 7 of a World Series. 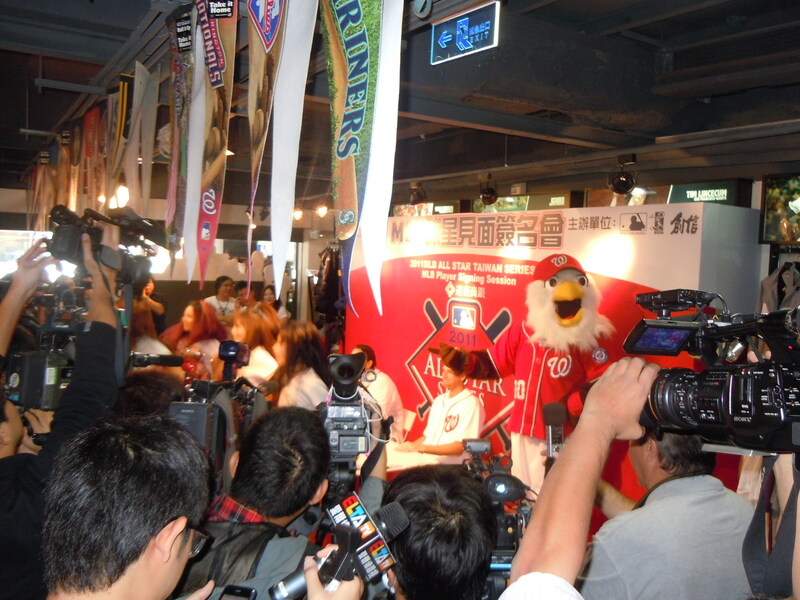 They are truly excited to have the MLB players here display their talents in Taiwan. Check out some pictures below of last night’s game. 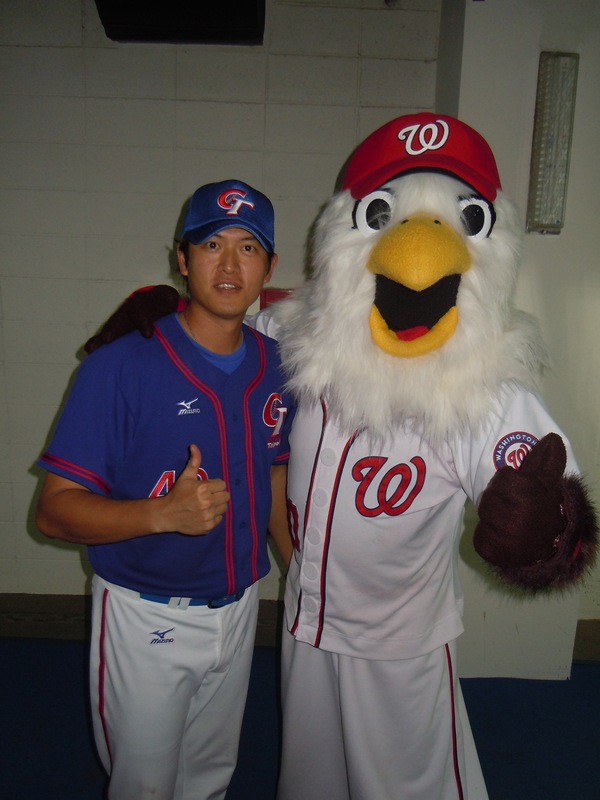 It was fun to meet with Wang before last night’s game! 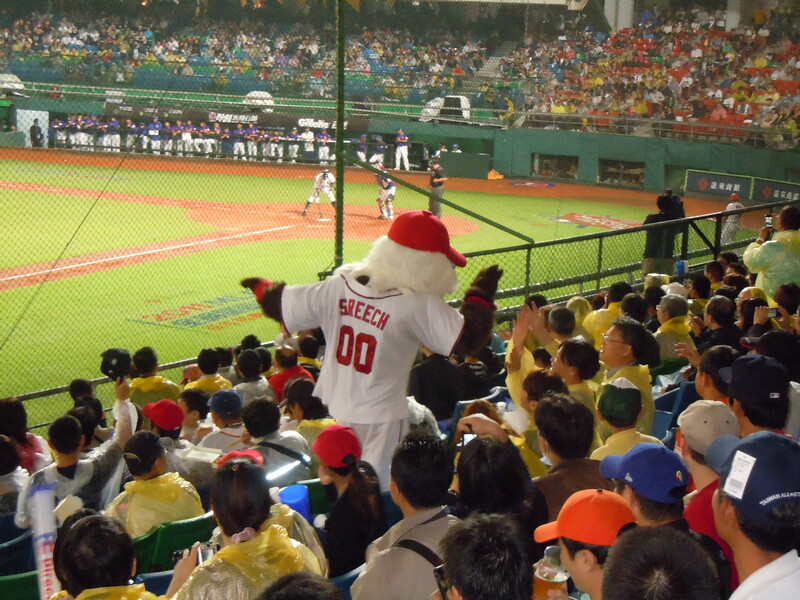 After experiencing last night’s game, it’s very clear that people in Taiwan are very passionate about baseball. The stadium was nearly at capacity a full hour and a half before the scheduled first pitch. 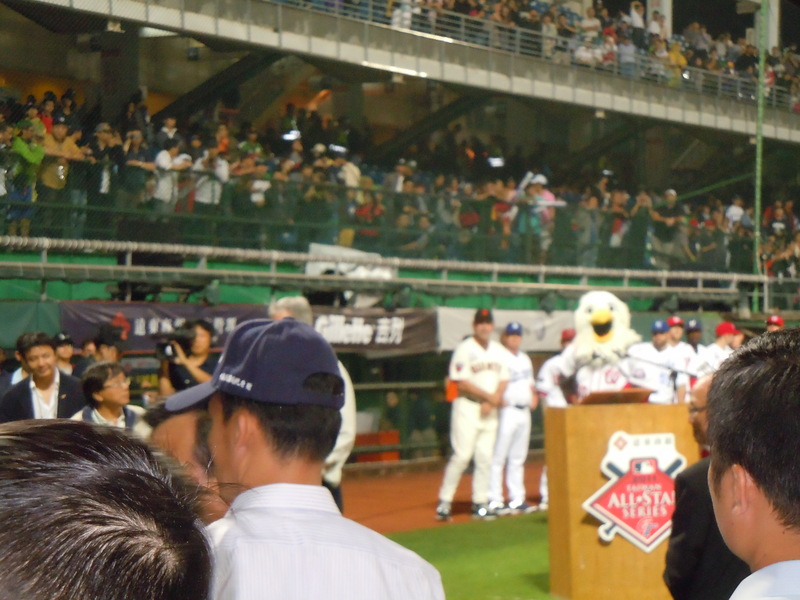 The atmosphere was electric and the people were genuinely excited to see the MLB all stars play in their home country. 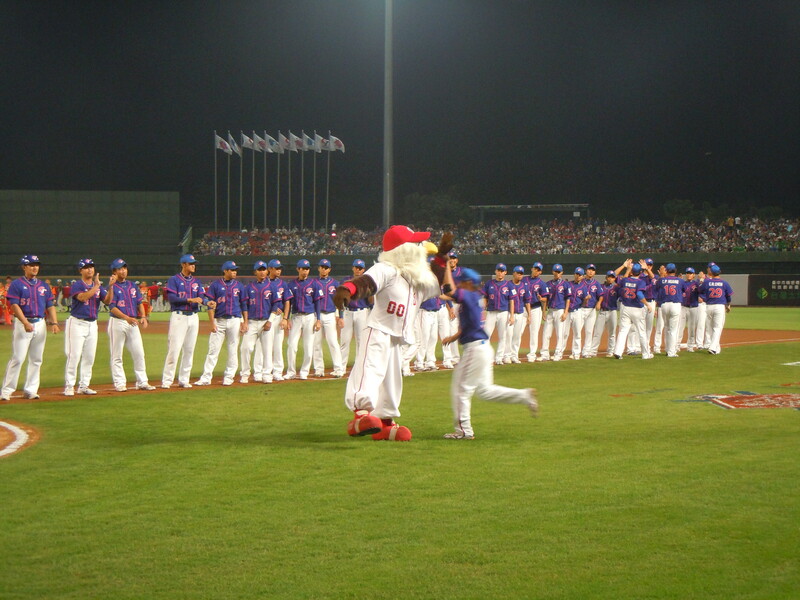 Unfortunately there was a bit of a rain delay to start the game so we weren’t able to do starting lineup introductions or have me deliver the first pitch to the mayor of Taipei. Instead, after anthems and a few speeches by VIPs including Taiwan’s president, we went directly into the game being played. 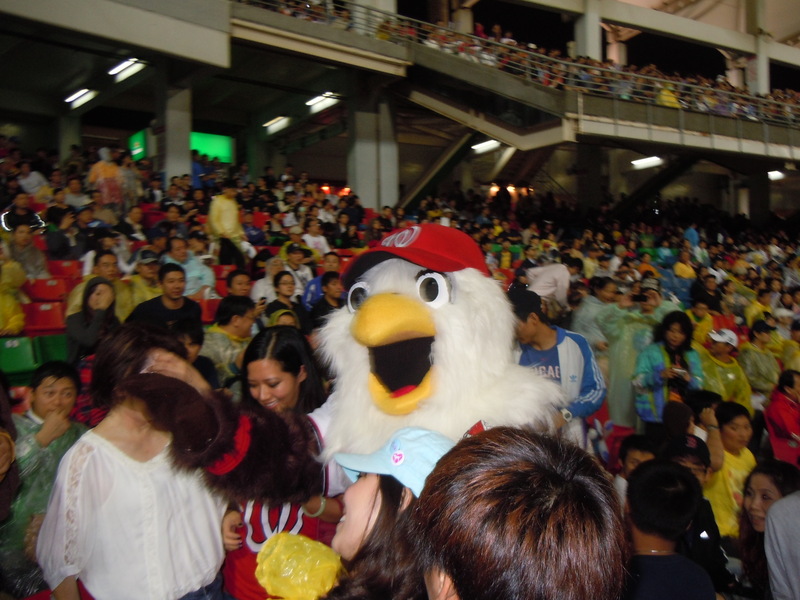 As the game was underway, it was clear to me that not only are the people passionate about baseball, they are also just as excited to see mascots. Wherever I went there was almost always a line of 50 or more people looking for a picture, autograph or simply a high five. 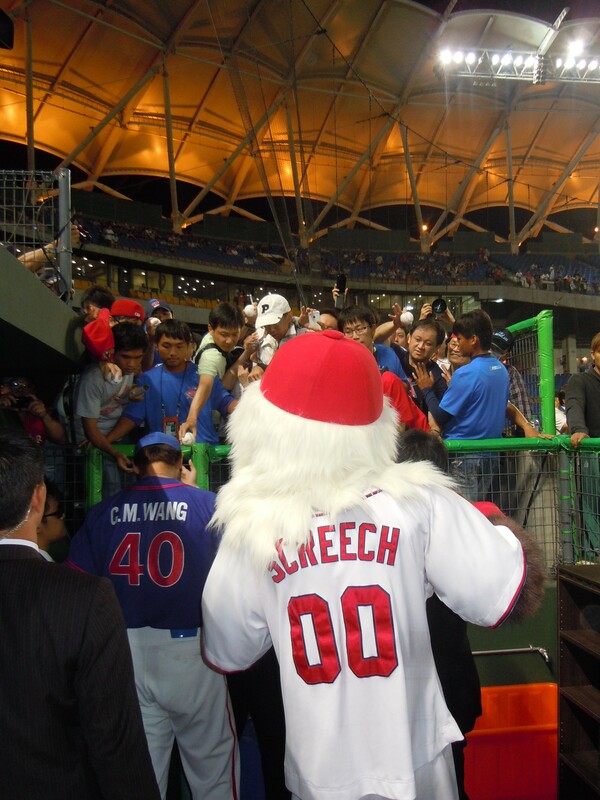 Throughout the game, I threw hats into the crowd, worked the stands and concourse and even did a magic trick turning a fan wearing a jacket into a fan wearing a Wang jersey. The MLB all stars ended up winning the rain-shortened game by the score of 7-0 with highlights coming from a Curtis Granderson grand slam and a Michael Morse double. 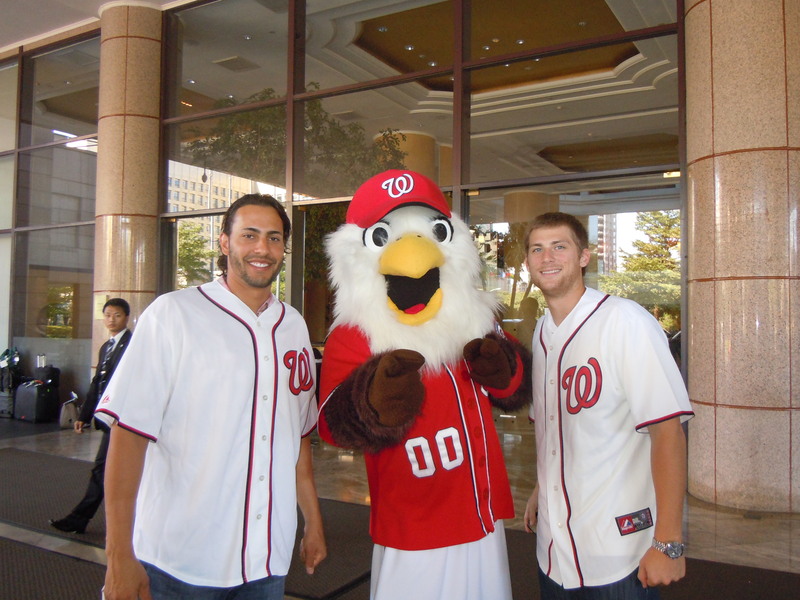 It’s very clear that Michael Morse is one of the most recognized and loved player from the MLB squad. Whenever he is introduced, there is a loud ovation. This morning I headed to an MLB store located in the center of Taipei with Michael Morse and Ross Detwiler for an autograph signing. Upon arriving, there was a line of people a block long looking to have their ball, picture, or jersey signed. When we went inside there were tens of Taiwanese reporters looking to get their questions answered. After a short interview with Michael and Ross, the two signed autographs for about an hour. I met all of the fans as they waited in line and even did an interview. Check out some of the pictures below of last night’s game and this morning’s autograph signing! 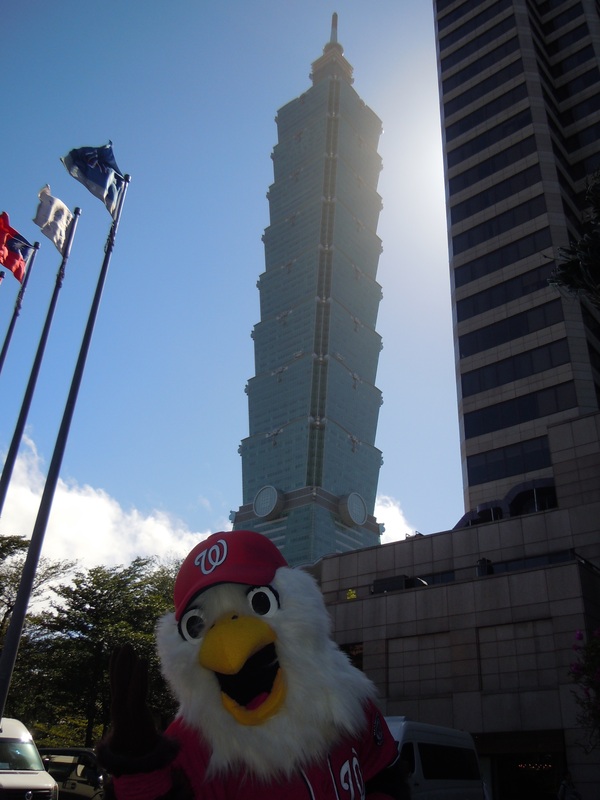 Also, take a look at me in front of the Taipei 101 building, the second tallest building in the world! The past two days have been extremely busy and I have a lot of pictures to share. Yesterday was “work out day” here in Taipei. I went to XinZhuang Field where the game tonight is going to be played to take in the team’s workout. As usual Michael Morse hit a few bombs out of the park during batting practice. 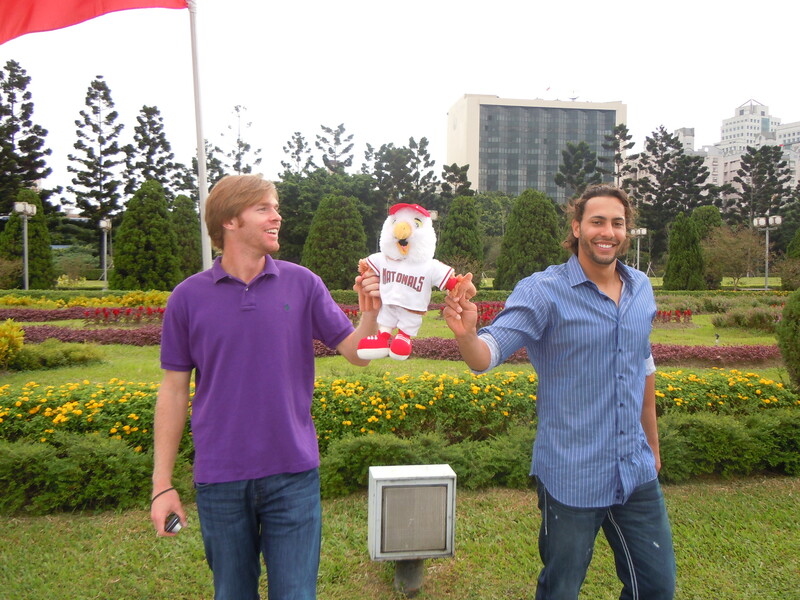 The media talked to Ross Detwiler and Colin Balester and both explained how excited they were to be in the country of Taiwan. From the workout yesterday, it’s clear to see that the Nationals have quite a following here as our representatives were one of the most sought after for an autograph or picture. Today I was able to tag along with the team to do some sightseeing in the city. 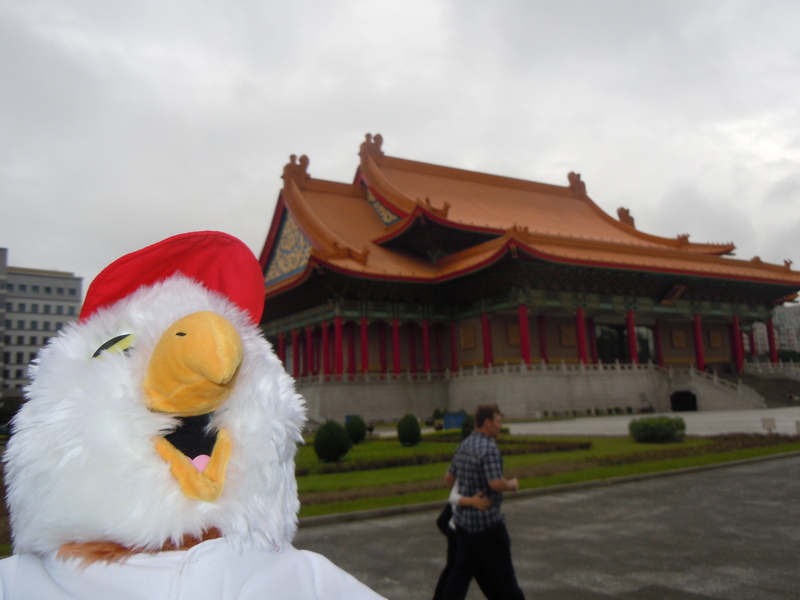 First we went to Chiang Kai-shek Memorial Hall. This is where the nation’s flag is raised every morning and the courtyard in fromt of the memorial serves as a place for national celebrations. In the main building is a statue of Chiang Kai-shek. After visiting the memorial hall we headed to Martyrs’ Shrine. Martyr’s Shrine is where statues of brave and loyal Martyrs are inserted into the four walls of the building in testimorny of their heroic war deeds. The city of Taipei is beautiful. scott on Here in Taiwan! Haley McClain on Turkey Day is Approaching!